The Emergency Department management of ankle fractures varies greatly between stable and unstable injuries. Unstable Fractures: Fractures that compromise the stability of the MORTISE (formed by the medial and posterior malleolae of the tibia, the lateral malleolus of the fibula and associated ligaments) are considered unstable. They often involve fractures to two or more of the malleolae (Bi-malleolar or tri-malleolar fractures). These injuries generally require surgery, and non-weight-bearing status. Stable Fractures: Fractures that do not affect the stability of the mortise, like some isolated distal fibular fractures, can often be treated non-operatively in a walking cast/boot and heal without surgery. Some unstable fractures, are obvious on physical exam and radiology, but some can be indistinguishable from stable injuries on initial evaluation. 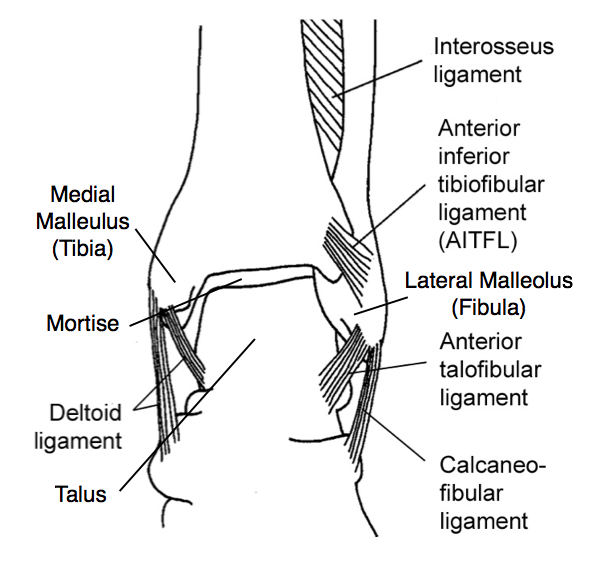 Bi-malleolar Equivalent: A fracture of the lateral malleolus can be associated with an injury to the deltoid ligament (which connects the talus and distal tibia and supports the medial aspect of the ankle joint) without a fracture of the medial malleolus itself. This injury pattern is unstable. 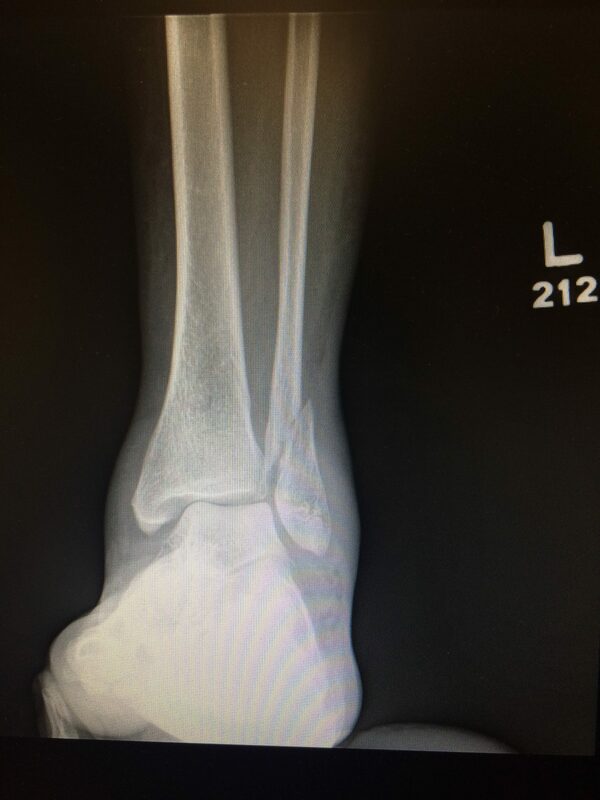 So if you see an isolated lateral malleolar fracture on x-ray, it could be a stable fracture (not much more than an ankle sprain) or an unstable injury that requires a cast and an orthopedist. A 42 year old woman presents with left ankle pain after a fall. She has swelling and tenderness over the lateral malleolus of her ankle, no tenderness over the medial malleolus, and no other gross deformity or injuries. Her initial x-rays are below. Ask yourself: What is the fracture? Is this a stable or unstable injury? Can she be discharged home in a walking boot? 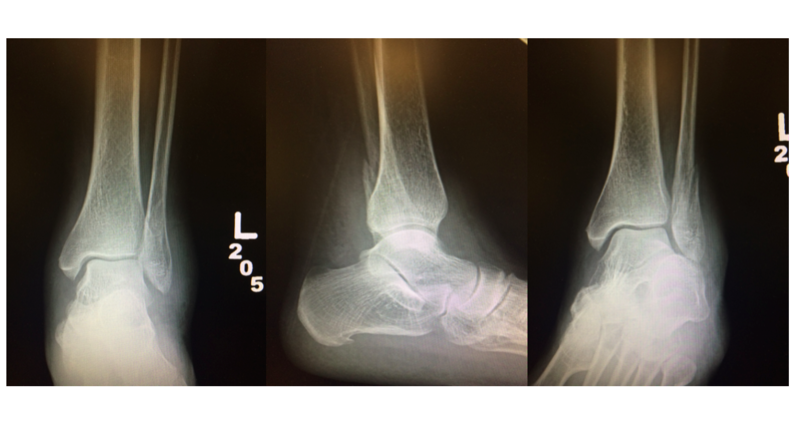 Every ankle series includes a mortise view, a nearly AP radiograph that is rotated to show the mortise in its entirety. The mortise joint space should uniformly be < 4mm and the distal tibio-fibular joint should be < 5.5mm. Disruption or widening of the normal anatomy is evidence of an unstable injury pattern, and widening of the mortise at the medial malleolus in particular suggests injury to the deltoid ligament. In our case the initial mortise view is normal (with the exception of the fibular fracture), but were not done. No orthopedic discussion is complete without a fracture-classification system, and I’m going to give you two. The Lauge-Hansen system is based on the underlying forces that cause an individual pattern or injuries, and the order in which they occur. The system is a little complicated, and is probably beyond what most of us can memorize for use in everyday practice. Luckily the Danis-Weber classification divides ankle fractures based on the location of the fibular injury compared to the level ankle mortise. Within these two systems most ankle fractures fall into three distinct categories. A: In a Supination-Adduction injury the fibula breaks first, with a fracture below the level of the mortise (Danis-Webber A). In more severe cases the tibia also breaks through the medial malleolus, and once both malleoli are broken the joint becomes unstable and the talus can shift inside the mortise. 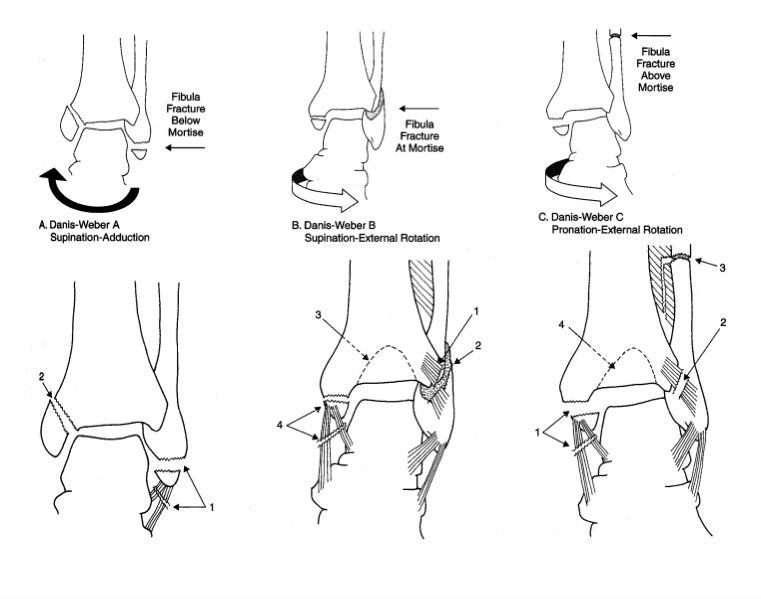 B: In Supination External Rotation injury the fibula breaks at the level of the mortise (Danis-Webber B). The fibula breaks first, the next injury (with increasing severity) is either a fracture of the medial malleolus OR a deltoid ligament is tear. Because a deltoid ligament injury is not seen on plain radiographs, an unstable injury can appear to be a stable one on a standard (i.e. non-stress) mortise view. The quick and easy way to differentiate these two are via stress view of the ankle. 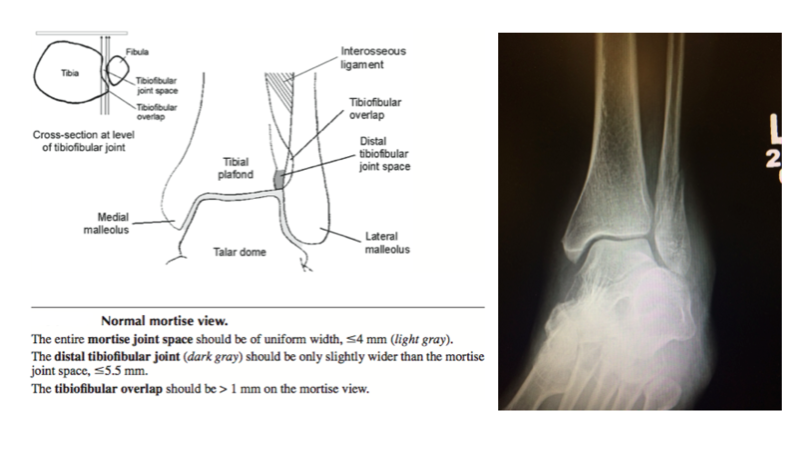 C: In Danis-Webber C the fibula fracture is above the level of the mortise. These injuries are caused by pronation and external rotation. They are almost all unstable injuries. The fibula breaks after injury to the medial malleolus or deltoid ligament. Although you can safely assume that the injury is unstable, a stress view is still useful to document the degree instability. You correctly classify this injury as a Dennis-Webber B (the fibular fracture is at the level of the mortise). As we just learned, there is no way to tell by looking at the above x-ray if the fracture is an isolated injury (ie an SER 2), or if it is associated with an occult deltoid ligament tear (SER 4). A stress view is indicated. But her medial malleolus isn’t tender to exam, How can she have a deltoid injury? It makes intuitive sense that an injury to the deltoid ligament should cause tenderness over the medial ankle, and that absence of tenderness could rule out an unstable injury without additional radiographs. Unfortunately, that’s not the case. In a 2007 study of 55 patients with isolated Danis-Webber B fractures, DeAngelis et al. found that medial tenderness was only 57% sensitive and 59% specific for a deltoid ligament injury (identified on subsequent ankle stress radiograph) (DeAngelis 2007). OK, but how do you do a stress view anyway? Since you know how, you obtain the above stress view of the patient’s ankle, seen here. An ankle stress view should be interpreted using the same parameters as the mortise view (return to that section of the post if you need a refresher). You can see that the medial clear space has widened, and it is in fact >4mm. This represents the presence of a deltoid ligament injury in addition to the fibular fracture, a bi-malleolar equivalent, which is an an unstable injury. Isolated lateral malleolar fractures at or above the level of the mortise (Danis-Webber B or C) can be associated with deltoid ligament injury (bi-malleolar equivalent) and should be evaluated with a stress view.